I would’ve liked to post something else to break up all the photoshoots, but I needed this to go up in April for the title to make sense. They’re just photos of Nevaeh that I didn’t use in my outfit review post, but I liked them too much to never do anything with them. 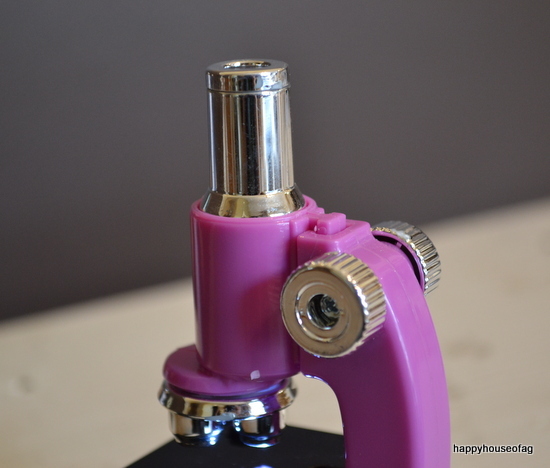 I guess my blogiversary giveaway is getting pushed back another month, and I’m really sorry. It’s taking a lot longer to come together than I expected. 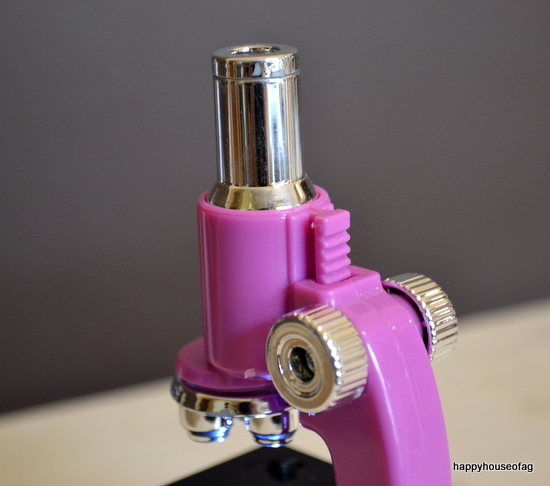 Spoiler alert: I’m probably going to say this exact thing every month until eventually this giveaway becomes a celebration for my fifth blogiversary. I may be joking now, but honestly, that’s exactly what’s going to happen. I know how much I procrastinate. 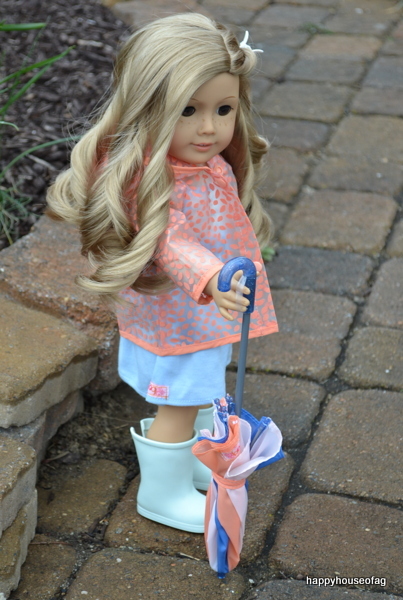 I bought a cute new Our Generation outfit for my dolls recently. I’m kind of in love with it and had to do a review (full-length photoshoot coming soon!). 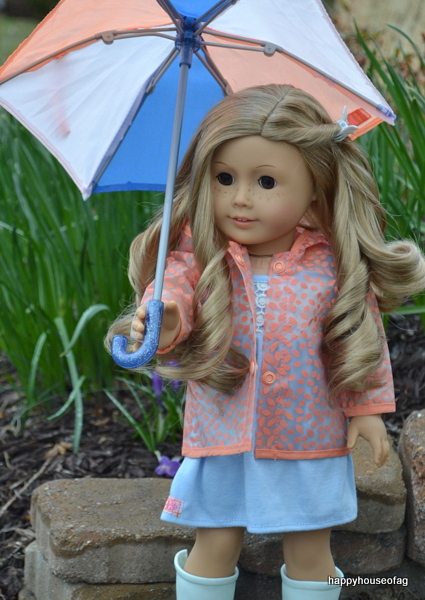 The set is OG’s Brighten Up a Rainy Day Outfit. 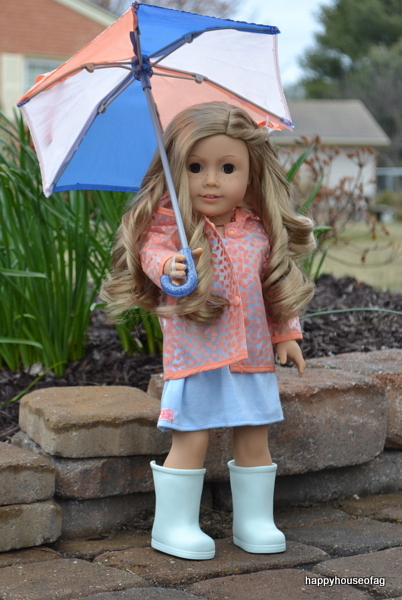 It’s $18 and comes with four pieces: an umbrella, rain jacket, dress, and rain boots. The periwinkle babydoll dress is a simple item that cuts off just above the knees. I like how basic it is because it works as a plain sundress, or you can add accessories for a fancier look. There’s a lace overlay on the bodice, and the dress velcros in the back. Next up: the raincoat. It’s made of clear vinyl with a coral pink pattern that looks like flower petals to me. I like the pink and blue together, it’s young and vernal. The jacket closes in the front with two plastic snaps. Unfortunately, there are no pockets, but the coat does have a hood. 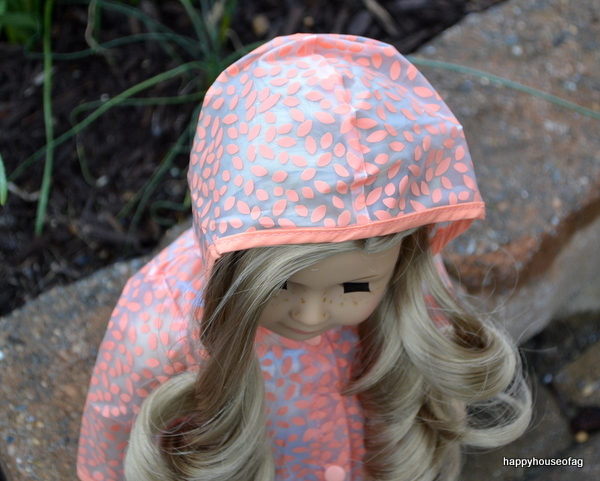 I found it kind of difficult to pull the hood over my doll’s hair. 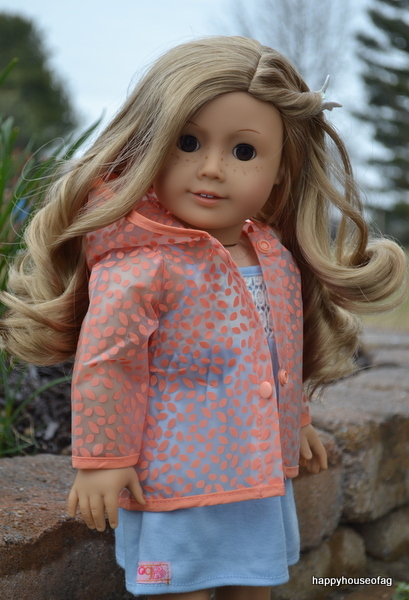 I had to unbutton the jacket and push all her hair over her shoulders, and even then, the hood was a bit tight. 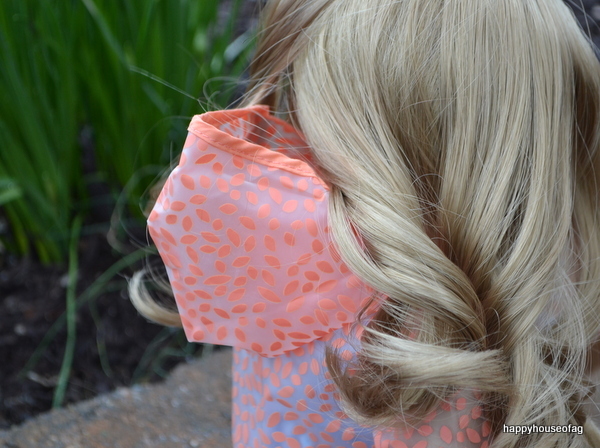 While I did get the hood to fit, I think it would work better on dolls with shorter hair, so you don’t have to try and stuff some of it down the back of the jacket. 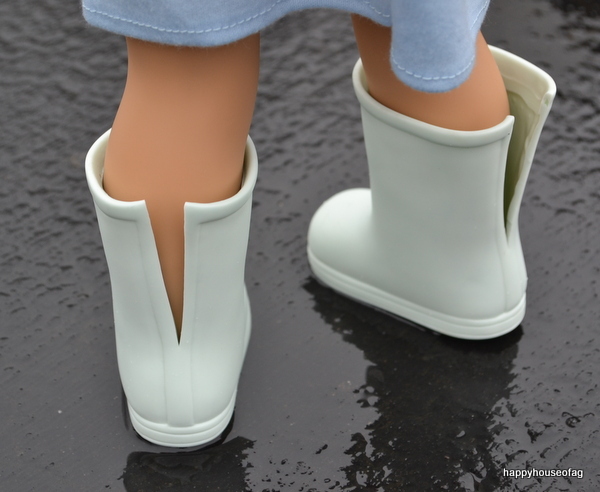 I have mixed feelings about the rain boots. They’re made of pale mint green rubber and are quite cute, but I had some problems with them. They’re too small for American Girls. 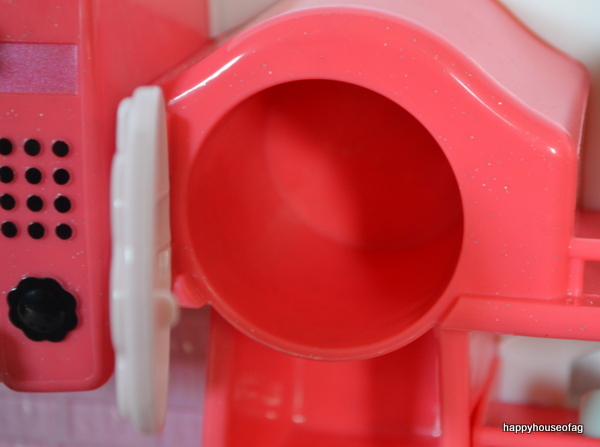 To get the boots to fit my dolls, I had to cut slits down the backs. Plus, the minty color doesn’t really match anything in the outfit. 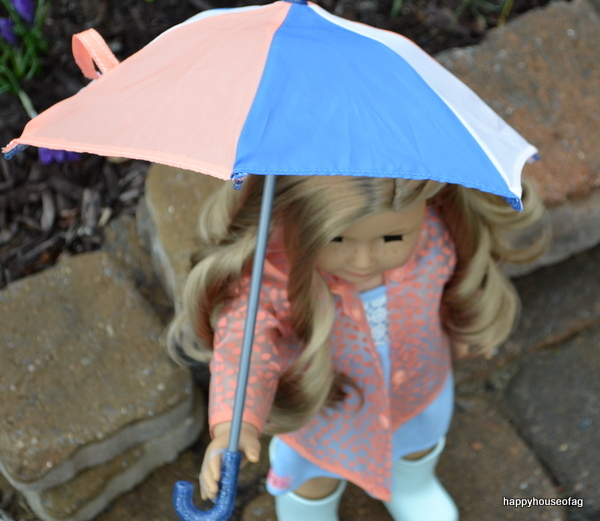 Finally, the best part of the outfit: the umbrella! 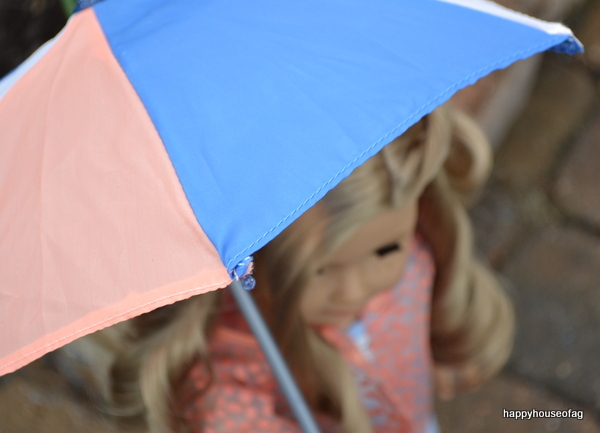 Here’s the inside of the umbrella. The opening/closing device (idk what it’s actually called) functions just like a real one. 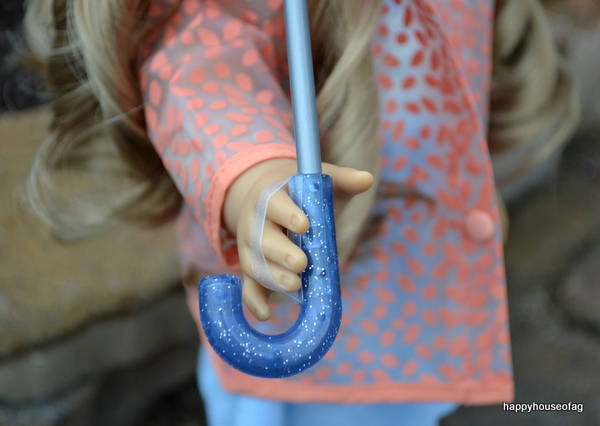 To help the doll hold the umbrella, there are elastic straps on the handle. 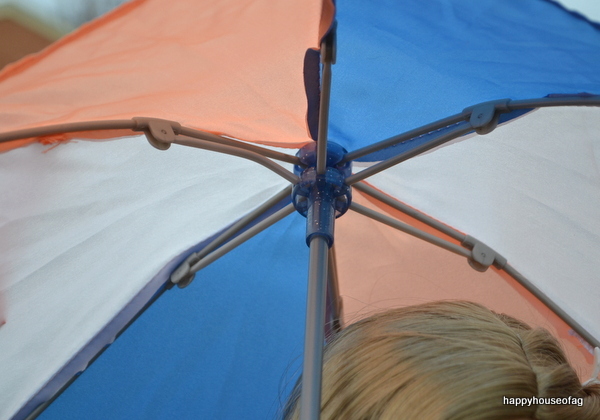 When the umbrella is closed, a thin piece of fabric can be wrapped around it and velcroed in place to keep it shut. 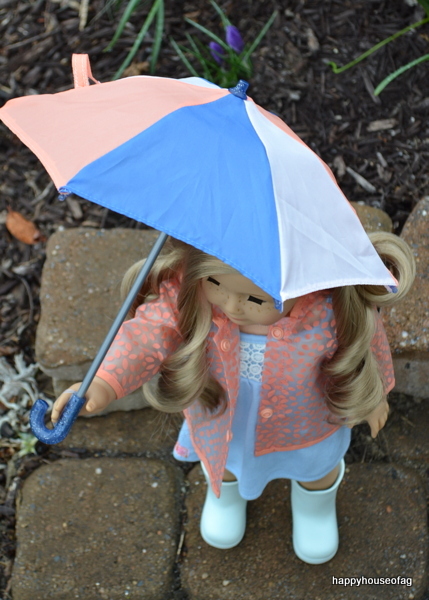 I was disappointed that the shoes don’t fit American Girl dolls, and I think there are too many shades of blue, but I do love this outfit. 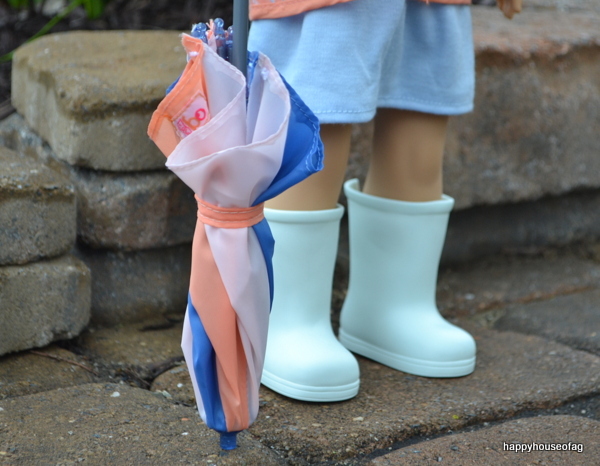 It’s adorable, perfect for spring, and I’m a bit obsessed with the tiny umbrella. Hey, guys! 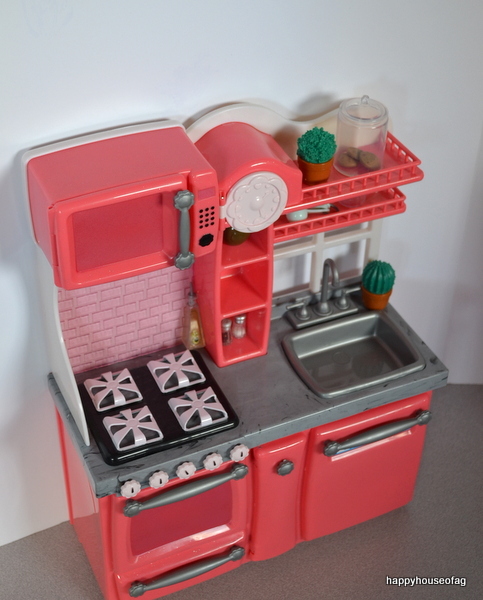 For Christmas, I got the Our Generation Gourmet Kitchen, and I thought some of you might like a review of this fantastic set. You can get it from Target for $65. 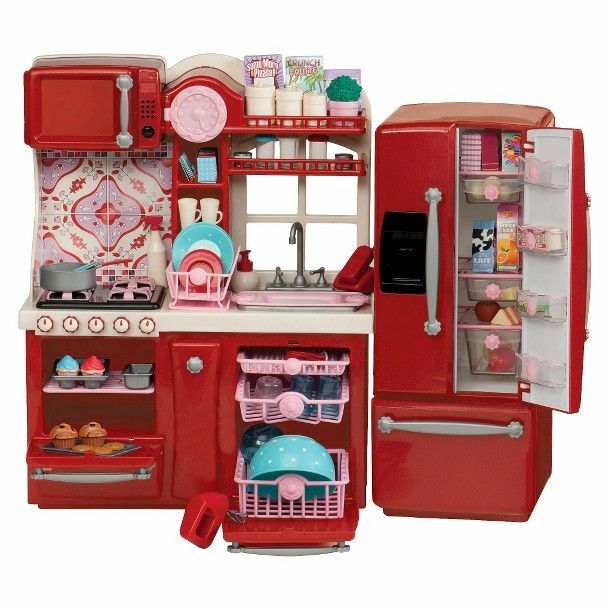 It has two main parts, a cooking area and a refrigerator. Both are made of hot pink plastic. 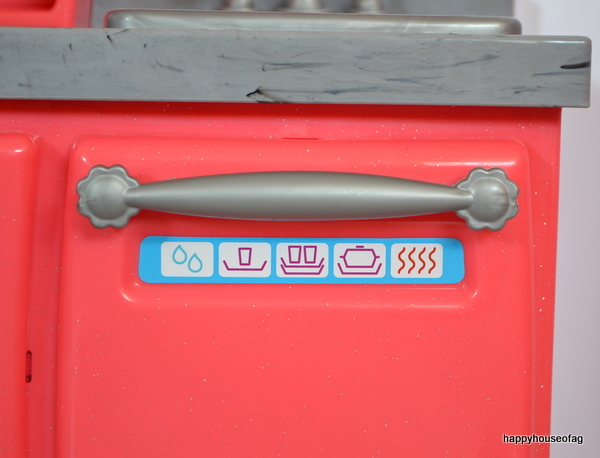 The cooking area has lots of fun features, like a microwave, sink, stove, oven, and dishwasher. The window of the microwave has a frosted look. 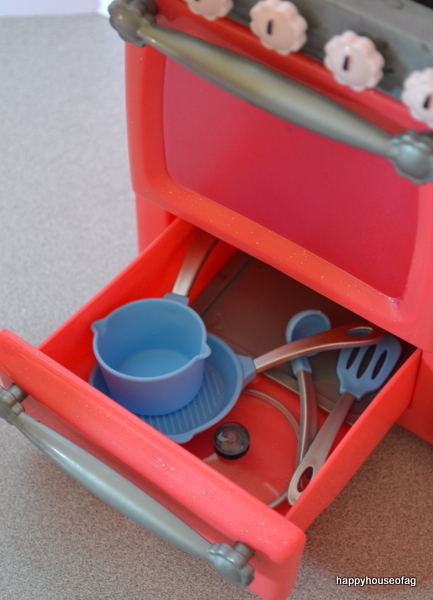 The inside is big enough for the included plates to fit comfortably. 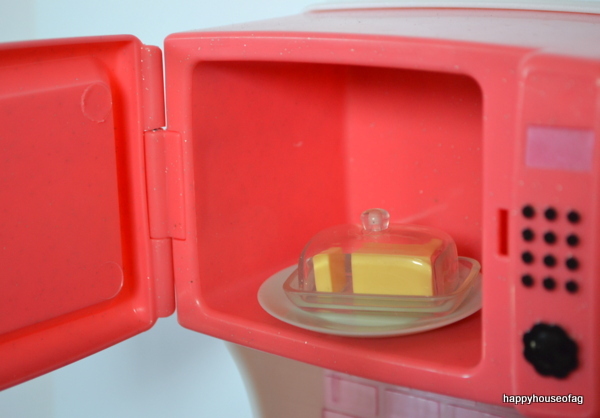 To the right of the microwave is a clock, above some shelving (the shelves are slightly slanted, so unless you put the objects all the way in the back, they’ll slip out). It has tiny hearts instead of numbers. The clock swings open to reveal a safe. My friend keeps the set’s cookies in there. Continuing to the right are more shelves. There’s not much room in the bottom shelf, but the top one is quite spacious. Beneath the shelves are a window and a sink. 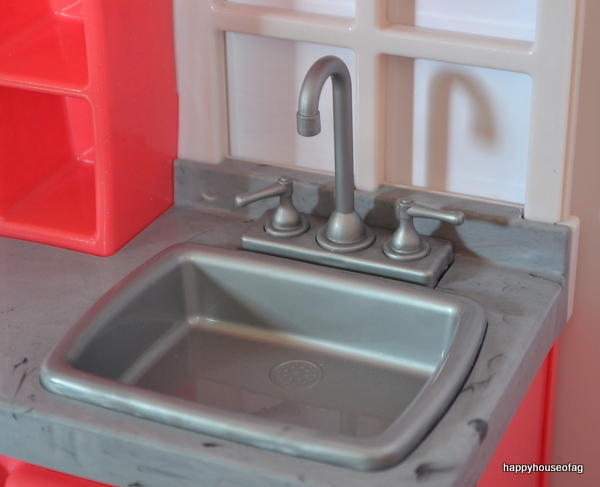 The sink’s handles turn. The counter is gray with some black streaks thrown in, giving it a marbled look. 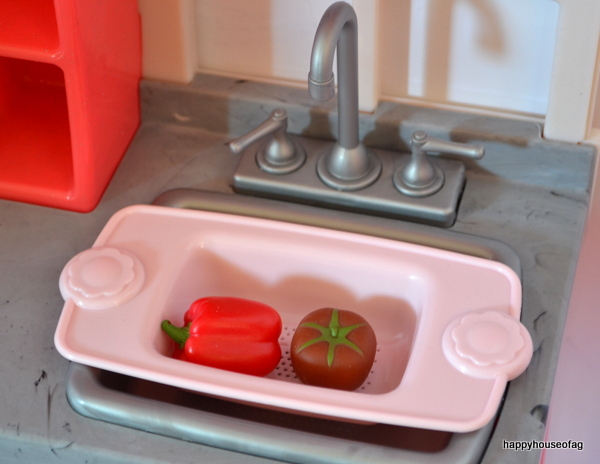 The set comes with a strainer that fits in the sink. Beside the sink is a strip of counter the right size for the drying wrack. It’s not big enough for all the plates and cups, and the blue plates are too wide to fit all the way in. On the left side of the kitchen is the stove. The dials turn, which is something I freaked out over when I first discovered it. 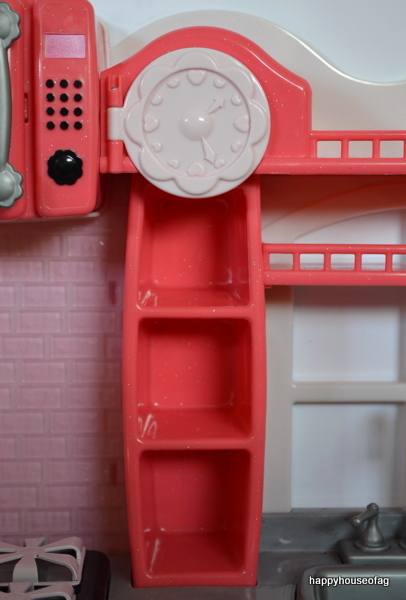 The backsplash is light pink, with thin plastic rectangles over it to look like tiles. 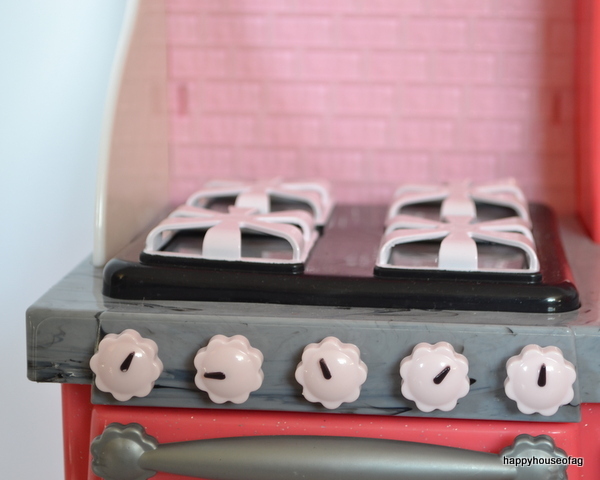 Below the stovetop is the oven. 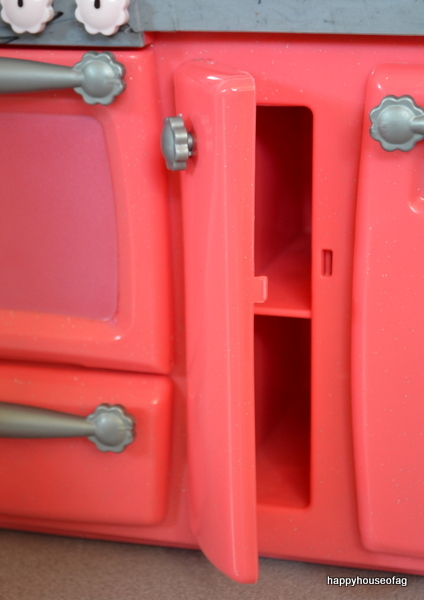 It opens easily to reveal the wrack inside. 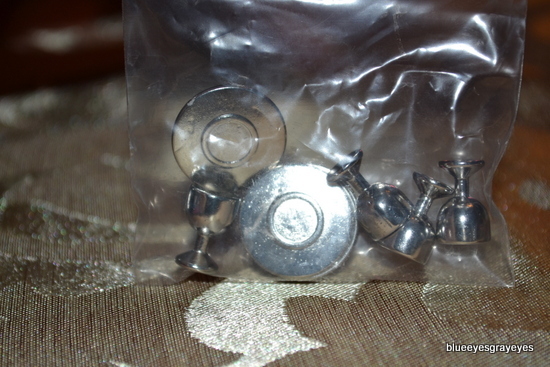 It can be pulled back and forth on plastic tracks and taken out. There’s a drawer under the oven where I keep the pots and pans. Moving to the right is a slim cabinet. 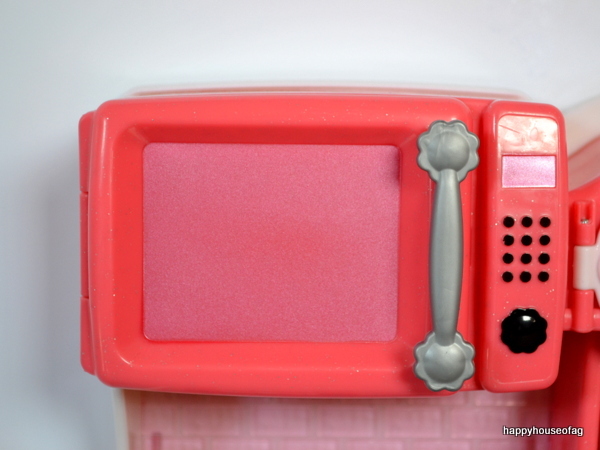 It’s so thin that not much can fit inside. The cabinet is a bit hard to close, you have to really slam it shut for it click into place. 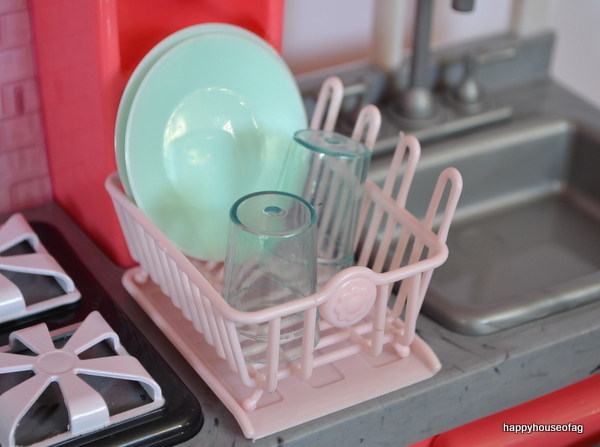 Next is the adorable dishwasher! Stickers on the front display the settings. 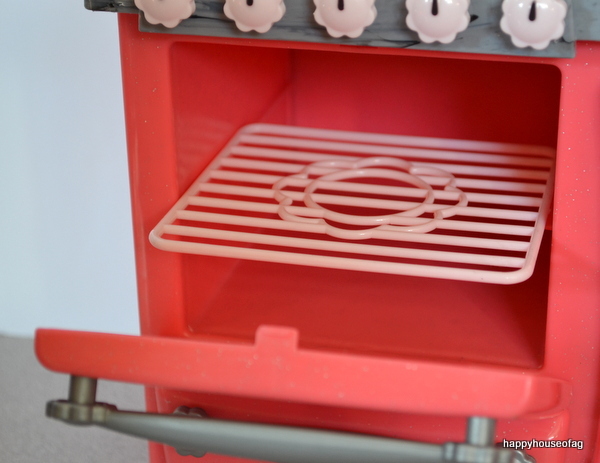 Inside are three plastic baskets that, like in the oven, can slide around on tracks. 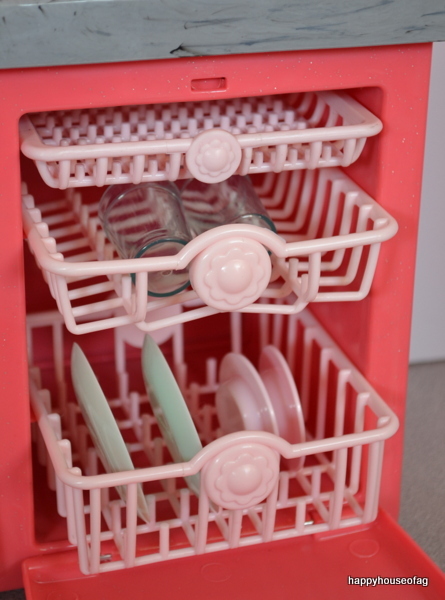 The first one is so close to the top of the dishwasher that a baking tray is just about the only thing it can hold, but the other two are a good size. 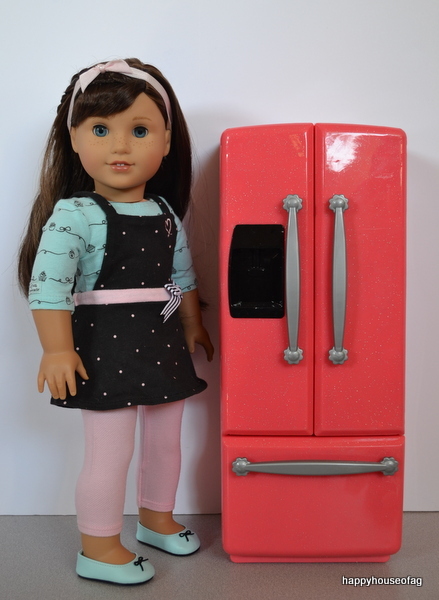 The second part of the set is the fridge, shown next to MJ for size. She’s a few inches taller, so it’s kind of short, but it doesn’t really take away from the quality of the set. 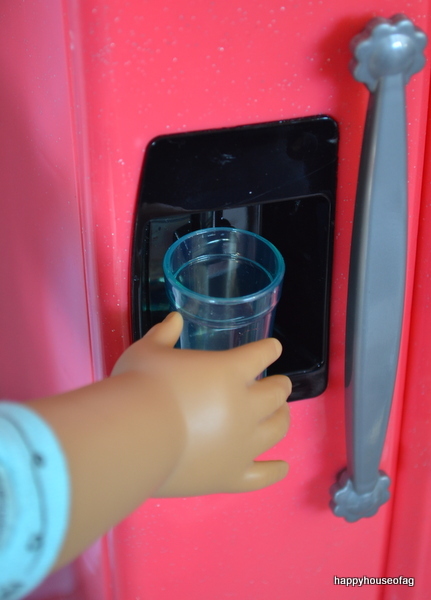 The refrigerator has a water dispenser on one of the doors. The included cups can fit in it without falling out. There are tons of shelves inside the fridge. 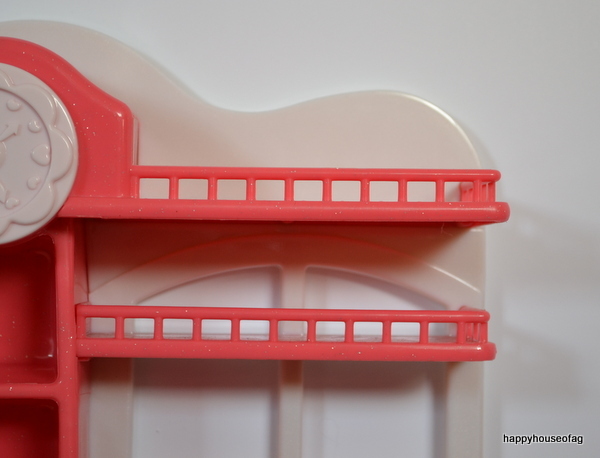 Plastic tracks line the sides so you can rearrange them how you like. 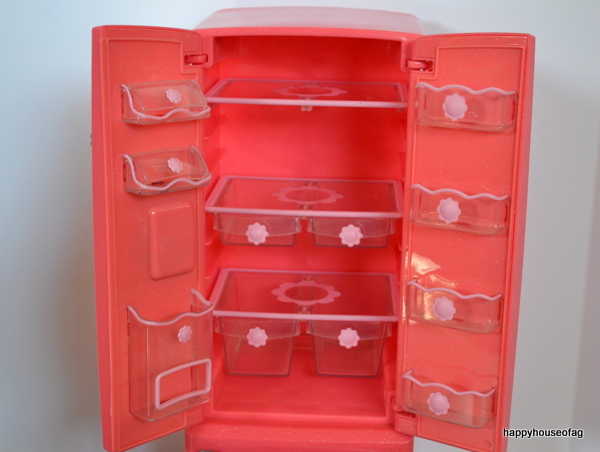 My only problem with the fridge is that all the storage on the inside of the doors are too small to accommodate any of the food. The freezer has plenty of room. I could probably fit all the food in the set in there if I tried. Now let’s take a look at the accessories. Here are the dishes: a cream mixing bowl with white dots, two cups, two plates, two saucers, a pitcher, and two mugs (which are much too small, in my opinion). 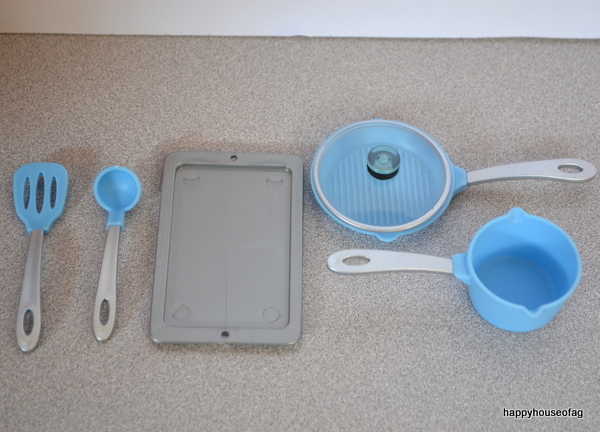 The cooking utensils: spatula, ladle, baking tray, pan and lid, and pot. 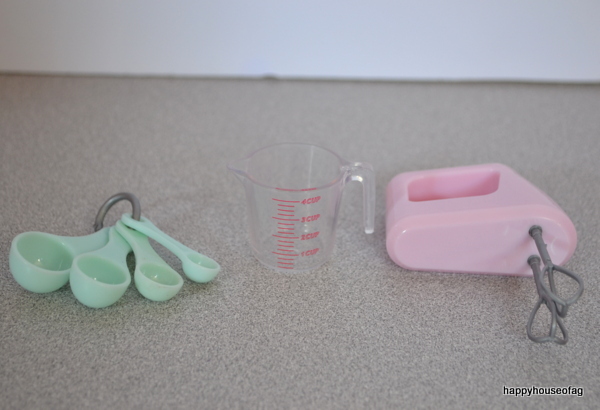 Baking supplies: measuring spoons on a ring, a liquid measuring cup with markings, and a hand mixer. 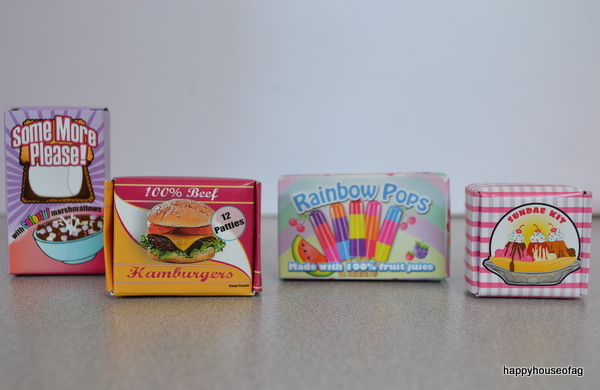 Now the really cute stuff — the tiny food. 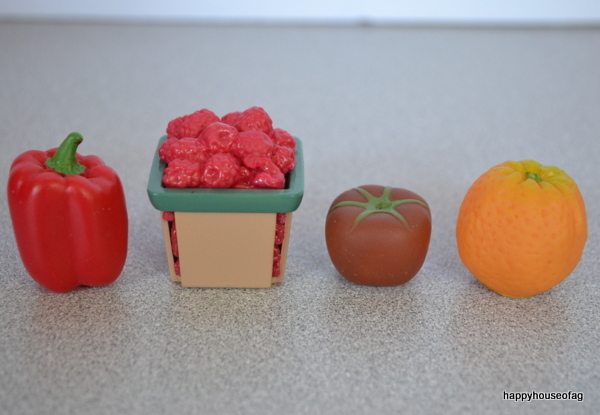 :) Produce: red pepper, raspberries, tomato, and orange. Everything but the berries are squishy plastic. 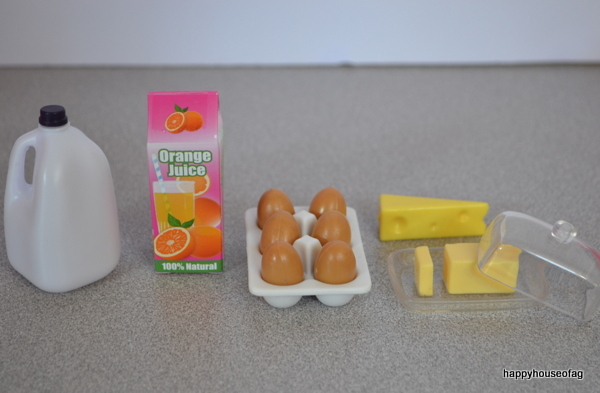 Milk, orange juice (with French on the back), eggs that come out of the carton, cheese, and butter dish. 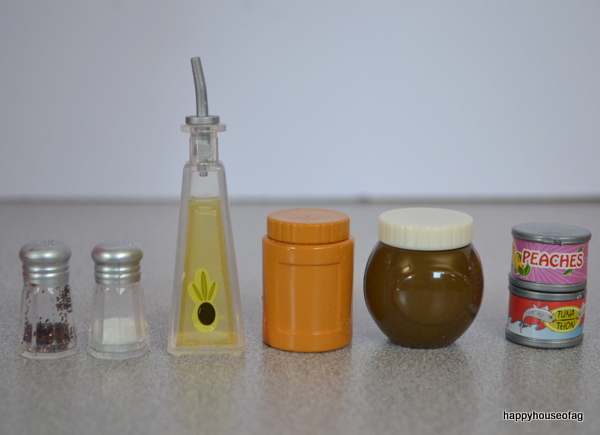 Salt and pepper shakers with glitter inside, olive oil, peanut butter, something that might be Nutella, and cans of peaches and tuna. 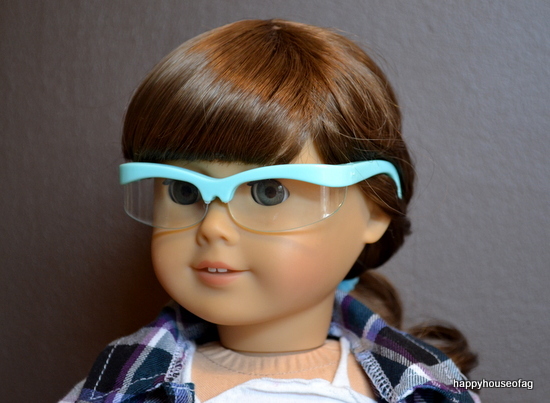 The last two are way too small for 18″ dolls, I think, but they’re still cute. 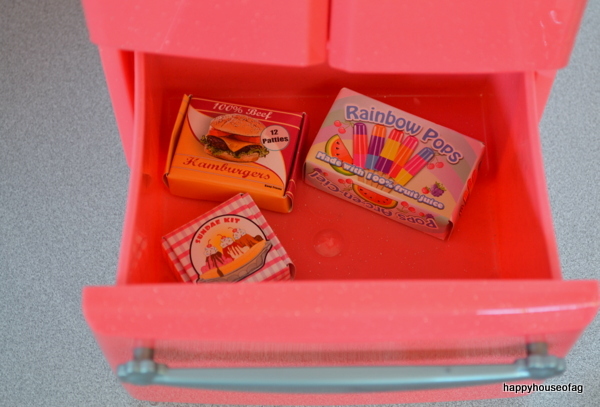 Box of marshmallow cereal, hamburgers, popsicles, and a sundae kit. They’re made of cardboard, so I’d be careful about accidentally squishing them. Everything is written in French on the other side. 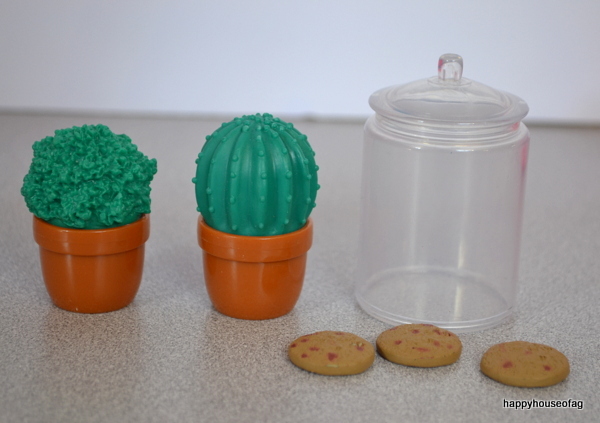 Some miscellaneous stuff: two plants, a cookie jar, and three chocolate chip cookies. I love this set so much. It’s simply adorable and I could spend hours playing with it and setting it up. The colors are pretty and everything is well made. 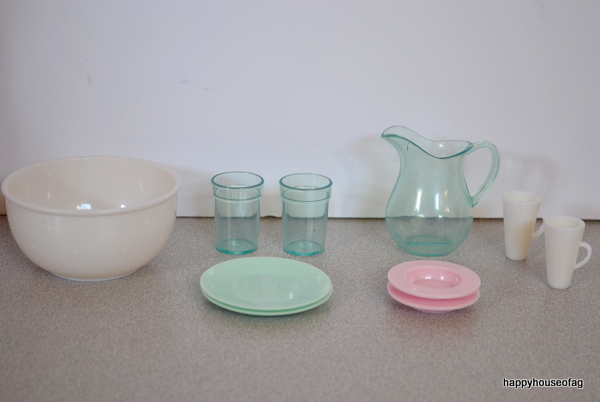 Plus, the food and dishes can be used as props in photostories. 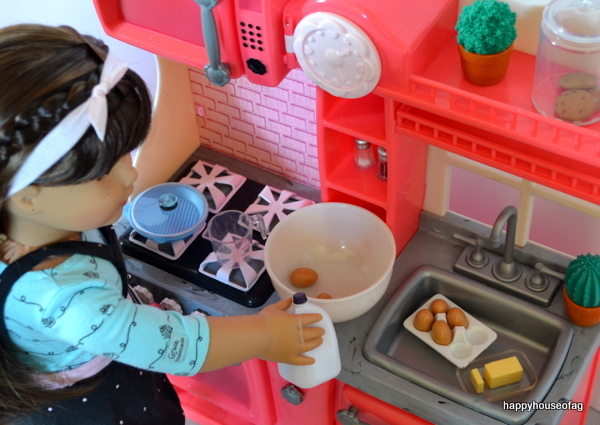 However, a lot of the food and some of the dishes are too small for 18″ dolls. 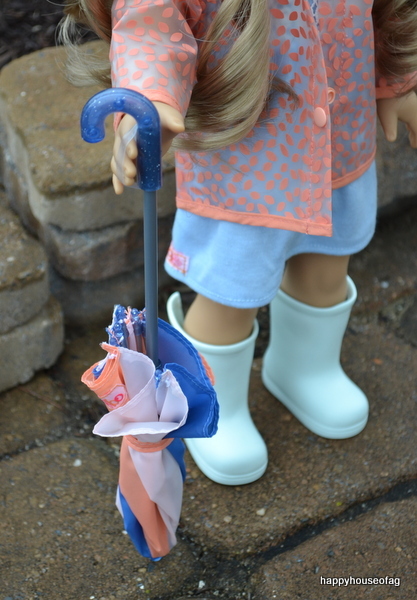 Things like the mugs and tomato are a better size for H4H dolls or WellieWishers. But overall, it’s an incredible playset that’s definitely worth $65. You can buy it here. Do you want this set, or do you already own it? What’s your favorite part? Mine is the salt and pepper shakers, eggs, and measuring spoons. Hey, guys! 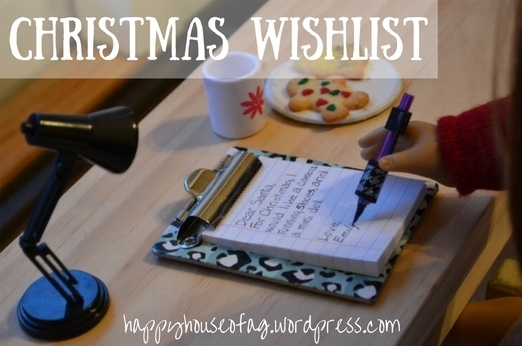 Christmas is right around the corner, so I thought I’d share my wishlist of doll things that I’m hoping to receive. There’s not as much stuff as in previous years, since I don’t like dolls as much as I used to, but there are still a few things I’d love to find under the tree. 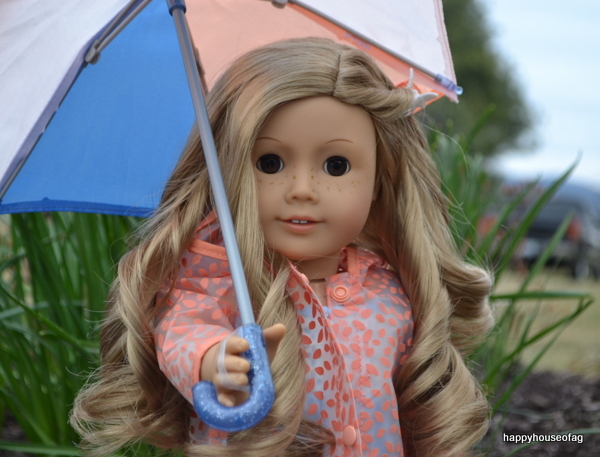 Lizzie is probably my favorite EAH doll. I love her color scheme and that she’s the Queen of Hearts’ daughter. 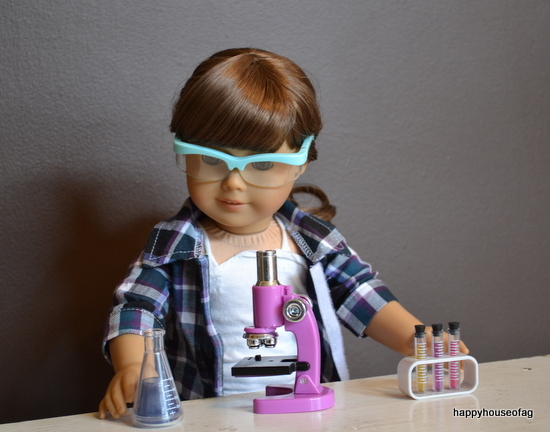 Honestly, the only reason I want her is because she’s pretty, but I guess that’s all that counts when it comes to dolls. My best friend has this set, and let me tell you, it is the coolest thing she owns. 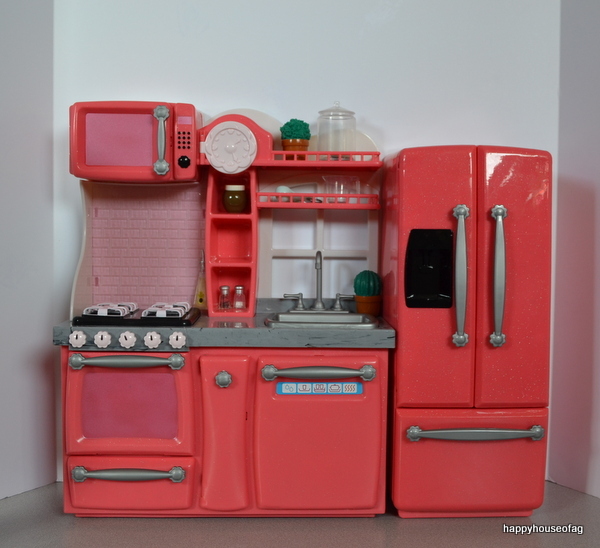 It would be great for photostories, because not only is it a sick kitchen, it comes with tons of dishes and food. I’ve wanted this thing forever, but I’m constantly broke and rarely have more than $20 at once. Which is why I’m asking for it for Christmas instead of buying it myself. This is the cutest outfit I’ve seen in awhile. Plaid skirt? Lace tights? Mustard yellow shirt? Sign me the heck up. It fits with the artsy aesthetic that I like, and idk, I just think it’s adorable and I want it a lot. 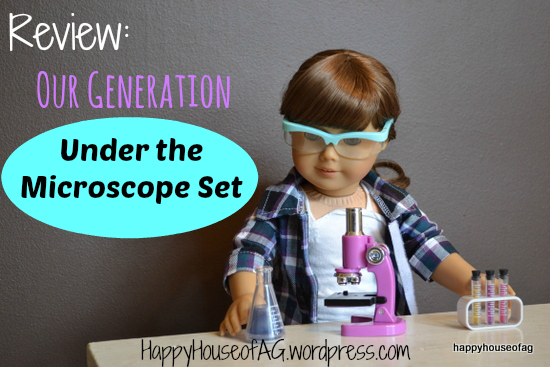 Today, I’m going to be reviewing Our Generation’s “Under the Microscope” Set. The safety glasses are plastic. 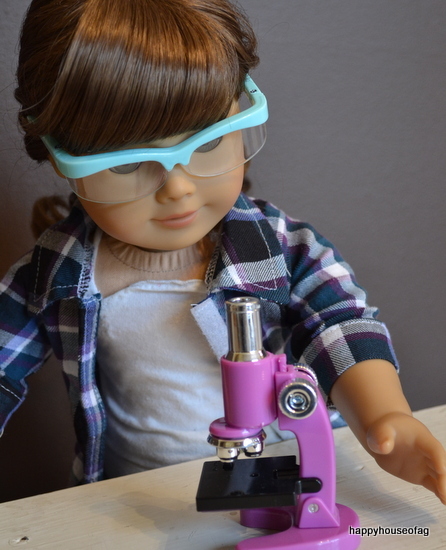 They’re a little hard to put on American Girl dolls — they’re designed for Our Generation dolls, after all. 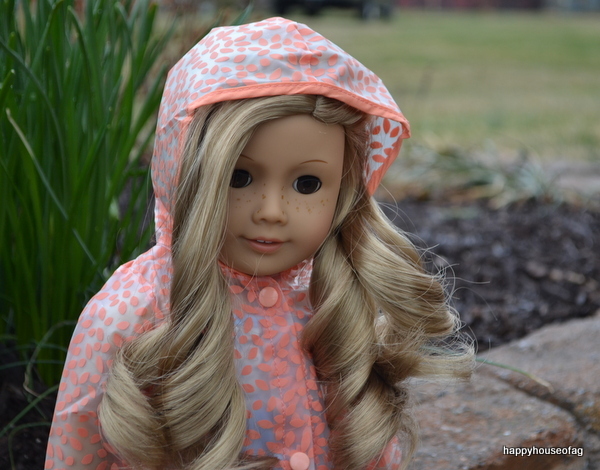 And I’m pretty sure OG dolls have thinner, more flexible heads. But once the glasses are on, they stay on quite well. 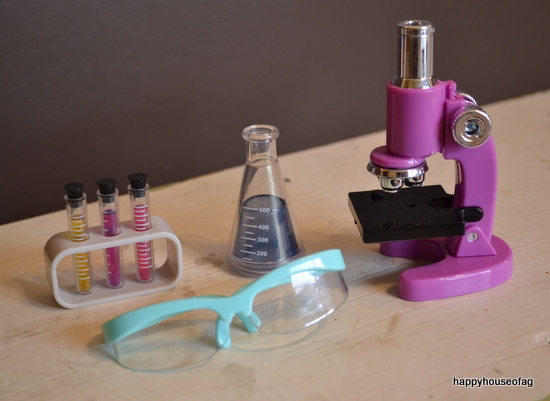 The test tubes are absolutely adorable, and are probably my favorite part of the set. They come in three different colors: yellow, purple, and pink. 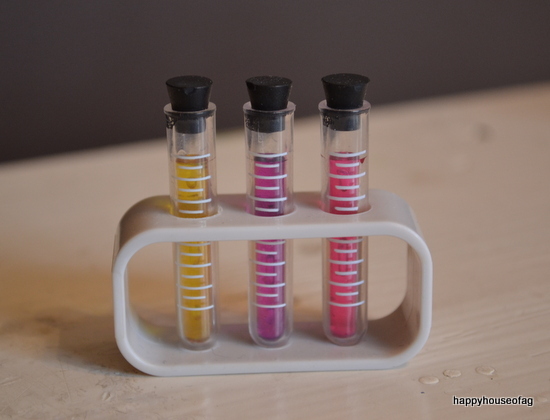 White marks are painted onto the plastic test tubes to show how much “liquid” is in each one. 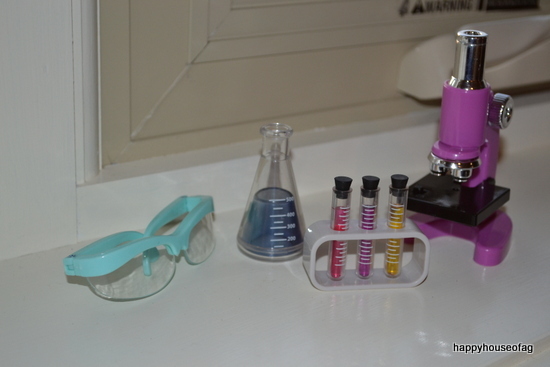 The tubes can be stored in the white test tube holder. 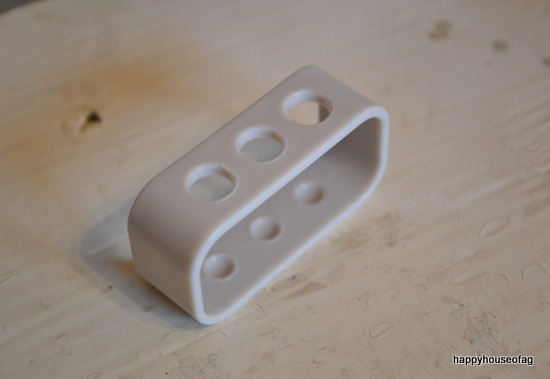 There are three circular dents in the bottom of the holder, which keeps the tubes from rolling around. 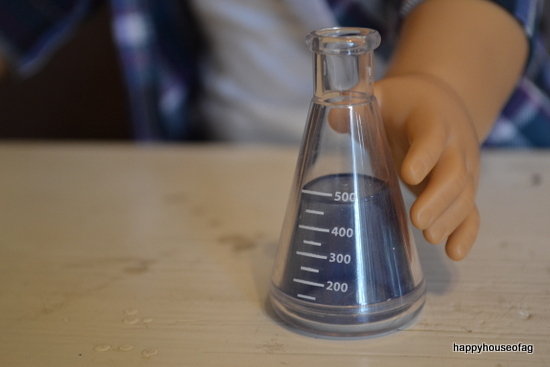 There’s also an Erlenmeyer Flask, which is larger than the other test tubes. It also has white measurment marks on it, but this one has numbers alongside it. A blue chunk of plastic is inside the flask to serve as liquid. It’s made out of purple plastic. 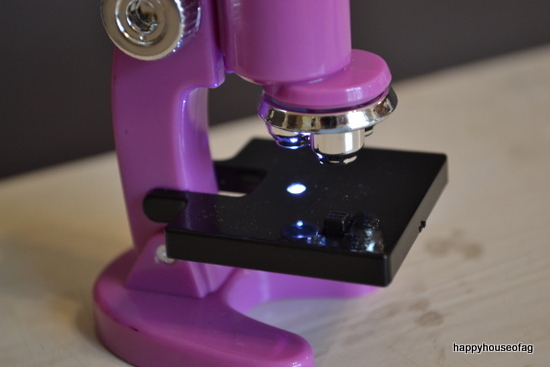 Flick a switch on the black platform and a focused points of light shines out of the microscope. 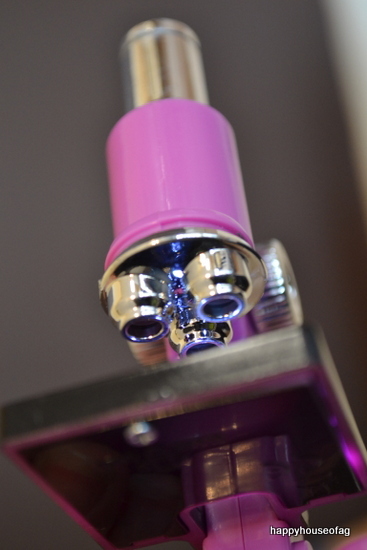 The silver knobs make the upper half of the microscope move up and down. See those silver circles? There’s a tiny slide inside each one! 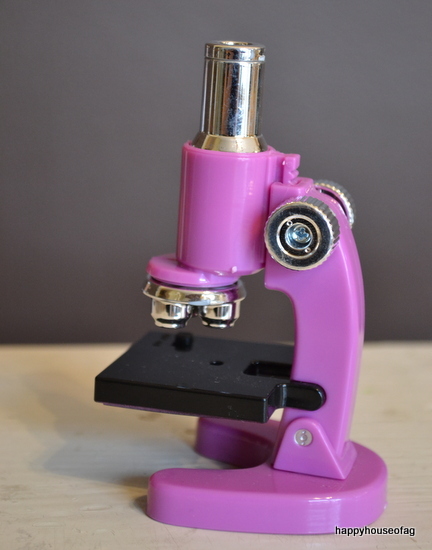 You can peer into the microscope and actually look at the slides. 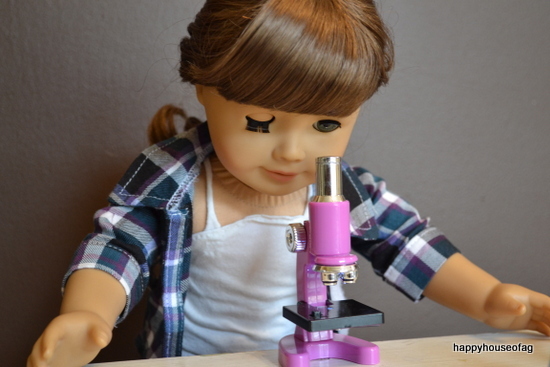 Our Generation’s “Under the Microscope” Set would be perfect for a science-loving doll or a science lab in a doll school. 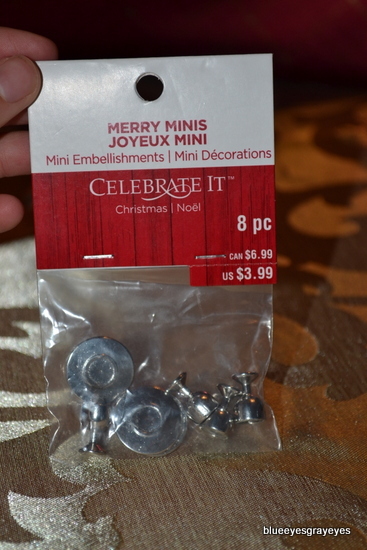 I’m going to be showing you the doll-related things I got for Christmas. I will be posting another haul with my human-y wuman-y stuff on my other blog, Blue Eyes, Gray Eyes. A deluxe Our Generation outfit, “Spin Away on Ice.” Since I’m not especially in love with this outfit, I’m going to return it. 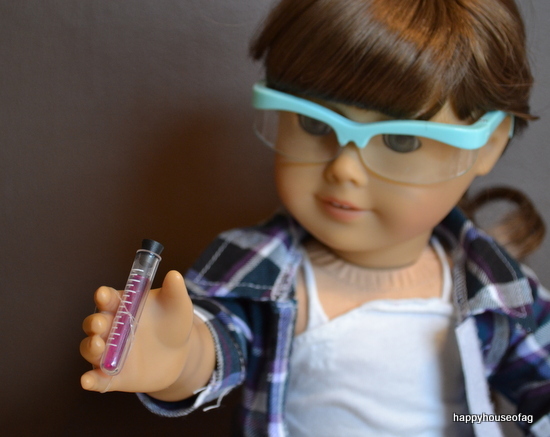 Then I shall spend the money I get back from it when I’m at the American Girl store for Lea Clark’s debut. I got “Grace Stirs Up Success” on DVD in my stocking. From my Nana and Pop-Pop, I got these adorable Our Generation boots! Try to ignore the “blueeyesgrayeyes” watermark on this photo and the next. This is for my mini dolls. It’s a collection of tiny plates and goblets.